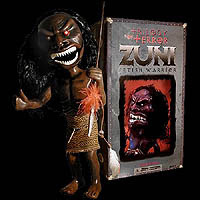 The Zuni Fetish Warrior figure is an excellent reproduction of the terrifying doll from the made-for-TV horror Trilogy of Terror. The film first aired on ABC on March 4, 1975. Majestic Studios brings us this 13 inch replica which includes a display base with logo. According to the storyline, Amelia purchases this "Zuni hunting fetish" for her boyfriend. Included is a scroll which claims that the spirit of a Zuni hunter actually inhabits the doll. It goes on to say that the gold chain being worn by the figure should never be removed because it would bring the spirit to life. You can guess what happens next! Legend Darkness on His Throne is captured in this massive 18" x 12" x 12" resin statue. Sculpted by Jerry Macaluso. SOTA Toys is releasing this as a Limited Edition of 750 pieces. "No Good without Evil. No Love without Hate. No Innocence without Lust. I am Darkness." The Lord of Darkness Premium Format Figure is now available for pre-order from Sideshow. 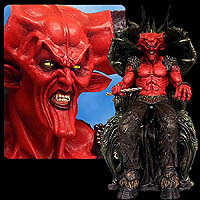 At over 23 inches tall, this impressive demonic fantasy character is hand cast in high-quality, heavy-weight polystone, hand painted and comes with a high-quality display base. Click on "Sideshow Collectibles" in the sidebar for more information.